Do you know of someone that just can’t wait to get photographs taken of their beloved pet. 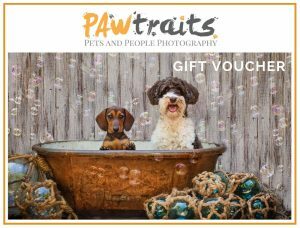 By giving them a PAWtrait’s gift voucher, you’re creating the purrr-fect gift to get them started. $250 Gift Voucher includes a studio or outdoor studio session plus a 12×8″ matted portrait. 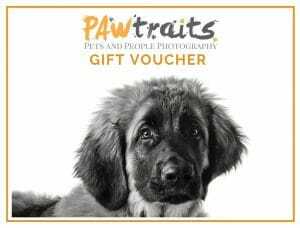 Gift Vouchers purchased include the Photography session with award winning PAWtraits Photography at our Northcote location and a purchasing appointment where the fun of the shoot is relived whilst the recipient chooses their favourite photos. This creative time is valued at $150. The entire purchase of your gift voucher covers your session and a 12×8 inch matted print! You can choose to incorporate an additional monetary value for ‘product’ spend for the recipient as there will be more than one portrait they will love. But this is entirely up to you. Multiple print packages start @ $660. More information on products and pricing, and what to expect from a PAWtraits Photo Session, visit our INVESTMENT section. 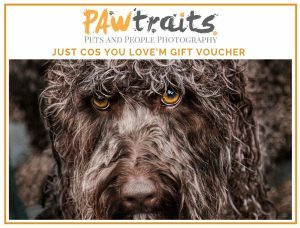 Note: The voucher is valid for 12 months and can be redeemed at PAWtraits - Pet and People Photography. Ph 03 9482 2006. A cash payment is not possible. 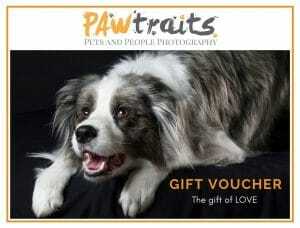 PAWtrait’s gift vouchers can be purchased from $250. *Gift vouchers are non refundable and not redeemable for cash. **Sessions “included” are for our Northcote location for one Family. Fees apply for Extended family sessions and locations. GIFT Voucher valid from 12 months from date of purchase.